was born in 1965. He received his diploma degree in process engineering with an emphasis on thermal comfort in cars and software development at BMW in 1993. After working as an engineer in environmental protection and research and development, he was a project manager for international plant construction in the chemical industry. 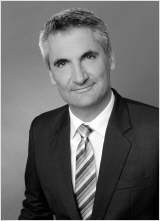 He started working in the field of intellectual property in Summer 2000 and passed the examinations for German (in 2003) and European patent attorneys (in 2005). He has been a full partner of the firm since 2005.